Allergy medicine is designed to alleviate the symptoms for allergy sufferers. Antihistamines like Clartin and Zyrtec block the histamine level in the body. Taken as prescribed by a medical professional, allergy suffers benefit throughout the allergy season. Decongestants like Sudafed help reduce swelling in the nasal passages and congestion in the respiratory tract. Depending on the severity of the allergies, some medical professionals may prescribe both an antihistamine and decongestant for added boost against allergies. Nasal sprays are prescribed to reduce the nasal swelling and drainage from the nose. Corticosteroid is the key ingredient in nasal sprays and proves to be an effective treatment in combating allergies. Some medications may cause drowsiness but there are other over the counter medications that can be used as a substitute. Over the counter pain medications like Tylenol and Motrin can be taken to alleviate the pain and inflammation caused by allergies-headaches, nasal congestion, sinus pressure, sore throat and chronic cough and chest discomfort. Allergic conjunctivitis which is an allergic inflammation of the eye and not caused by the bacteria of regular conjunctivitis. Common causes of this allergy are pollens, dust, animal dander and molds. The eye becomes itchy and inflamed. 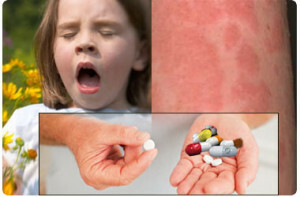 Over the counter treatment is available but sometimes can cause the allergy to become worse. Chemicals in makeup and powders can cause inflammation around the eye. This type of inflammation is a contact dermatitis allergy. For allergic asthma, individuals can be treated with two different types of medications-corticosteroid or non-corticosteroid. Corticosteroid medications are oral and inhaled. Oral medications(Prednisone) are given to knock out an immediate attack. This medication is not recommended as a long term treatment for allergic asthma. Inhaled medications(Proventil) are extremely effective with limited side effects. Inhaled medications can be used in a rescue form(when symptoms are brought on by exercise) or long acting. This medication is used with a spaced chamber for monitoring the correct amount of dosage administered or can be used inside a nebulizer. There are a few different non-corticosteroid medications for the treatment of allergic asthma. Zaditen is a medication approved only in Canada. There is still controversy over whether this medication can effectively control asthma. Leukotrienes antagonist(Singular) is used to treat mild and less severe asthma. Combination therapies are a mixture of an inhaled steroid(Ventolin) and a long-acting inhaler(Advair). For food allergies, there is no specific treatment except for eliminating foods from the person’s normal diet. Treatment of severe food allergies that cause an anaphylactic reaction requires the administration of epinephrine. Anaphylactoid reactions almost like anaphylaxis are not considered to be an allergy. These reactions triggered by drugs and contrast (found in radiographic studies) do not involve the immune system and happen with individuals who suffer from allergic rhinitis. Non traditional approaches to taking medication for the treatment of allergies have been gaining popularity over recent years. Aromatherapy has been used to treat suspected food allergies but not for respiratory allergies. Homeopathic remedies have stirred interest for allergy sufferers. Many people are turning to trained homeopathic practitioners in search of a good cure. Acupuncture and biofeedback have been touted a successful treatment for allergies. Cleansing diets can eliminate immediate toxins and allergies but have not been proven effective to completely eradicate allergens. Do Air Filters Help Relieve Asthma Symptoms?